The vibrating sounds of a blender faintly take over music, playing inside a quaint juice bar in Brooklyn, New York. It’s called Juices For Life, situated in the Bedford-Stuyvesant or ‘Bed-Stuy’ area of the city. In the early hours of dawn, Yee co-hosts The Breakfast Club, known to some as the 'The World’s Most Dangerous Morning Show.’ She along with DJ Envy and Charlamange the God dissect front-page news and pop culture headlines to millions of listeners on the radio airwaves each morning. Yee has a sweet tooth. ‘Candy Ang’ was her childhood nickname. ‘My house always had all the junk food. I used to drink soda everyday, Hi-C everyday, and Hawaiian punch. That’s how I grew up in Brooklyn,” she admits. Juices for Life in Brooklyn, is the franchises’ fourth location. Renowned rappers Styles P and Jadakiss own two spots in the Bronx and another in Yonkers. When Yee learned about how they were making their respective hometowns healthier, Yee tracked down Styles P hoping to do the same. “He’s all over the place and so I had to bum rush his video shoot!” she joked. 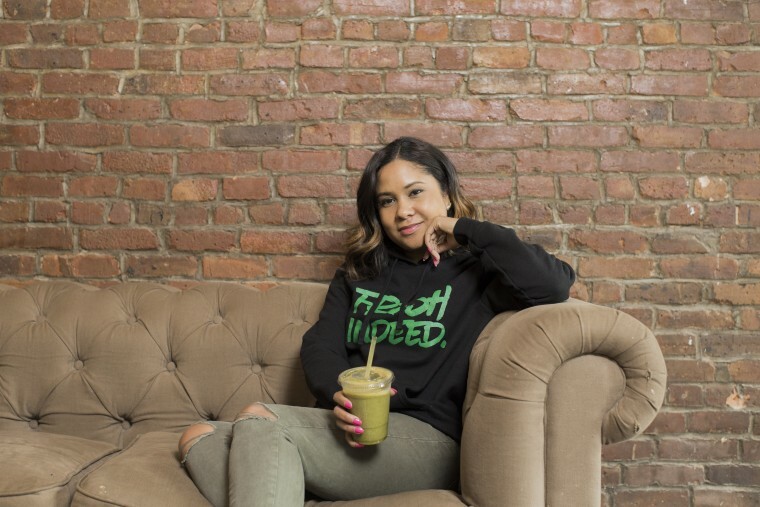 With the rapper's blessings and business acumen, Juices for Life opened in September 2016, with Yee adding her personal touch in her beloved neighborhood. According to a 2015 New York City Department of Health and Mental Hygiene Community Health Profile, 64 percent of the population in Bed-Stuy is Black. One in three residents lives below the Federal Poverty Level. It is the eighth-poorest neighborhood in New York City. And 34 percent of adults consume 1 or more 12-ounce sugary drinks a day. On Malcolm X Boulevard where Yee’s juice bar is found, bodegas border nearly every other block. Fresh produce for sale is scant in these small corner stores. Tobacco, candy, alcohol and soda are plentiful. While 77 percent of adults self-report their overall health as “excellent,” Yee wants to take that number even higher. “I’m just trying to it make it more convenient to be healthier so there’s no excuses” she says. Seven days a week, a knowledgeable staff combines fusions of bright fruit and vegetables into tasty drinks at prices customers say are affordable. For $5 people can choose between 19 different juice combinations like "Superthug” which has apple, lemon, ginger and pineapple in it. There are $6 specials with another 51 distinct juice selections including papaya, spinach, kale, grapes and beets. “Berry Blast,” Yee says, is popular among buyers for its apple, strawberry, blueberry, blackberry and banana blend.